Talking to many of my colleagues – we all agree that one of the best thing ever invented in virtualization world is VMotion. Then Storage VMotion came along, and in vSphere 5.1 – Cross-vMotion (aka x-vMotion) that VM’s state and storage can be vMotioned to a different host and/or cluster without Source and Target hosts having a shared storage space. Now when all of us are looking at public clouds the excitement of such functionality could wear out. And personally I love to investigate and implement new things that no one ever implemented yet. However there is a lot of my colleagues who will be still using vSphere for years and possibly even decades. This week I was approached by one of my friends, colleague, brilliant engineer and former customer who was confused by two posts from two exciting leaders of Virtualization movement – Duncan Epping and Frank Denneman. 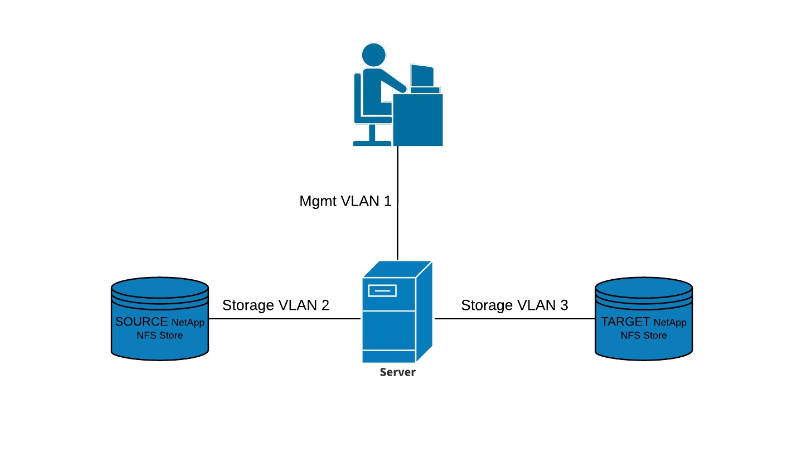 In short – these posts are talking of leveraging Management and vMotion Networks for data transfer using NFC (Network File Copy) during VM migration. So the concern was that during migration between NetApp filers the traffic will hit the Management network and causes some unpredictable behavior as the Management network has some restrictions (ACL, Traffic prioritization and so on). My first reaction was there is no reasons to go to the management subnet. I would think of this ESXi host as a standalone Linux box performing remote copy command from a remote NFS share on VLAN 2 to another remote NFS share on VLAN 3 and there is absolutely no reasons to go to VLAN 1. Frank’s article (mentioned above) is talking about difference in transfer of hot data vs cold data and how cold data gets moved through vMotion and Management subnets. To clarify difference between our environment scenario and Frank’s post – I had to draw the picture below. As you can see it’s completely different situation – in Frank’s scenario – xVMotion is happening (both VM and disks are migrated without shared storage) and FC SAN is used instead of NFS. 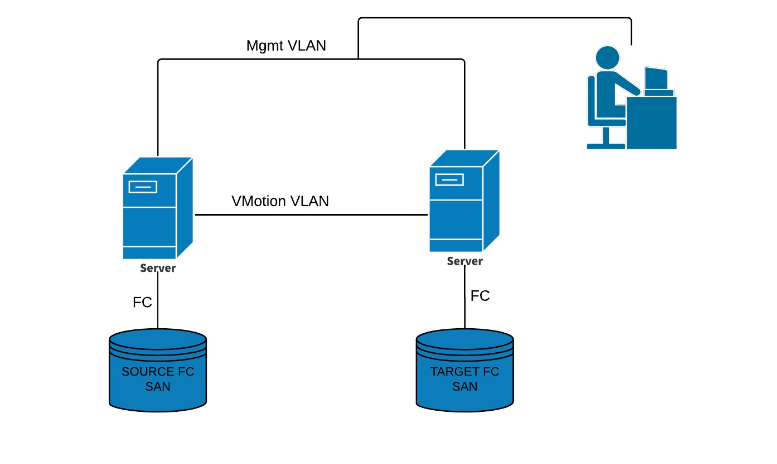 In that case two hosts are connected to different SANs and there is no way data can be transferred through FC network – so hosts use combination of Management and vMotion networks to transfer a VM from Source Datastrore through Source ESXi to Target ESXi that places VM on the target datastore. There are two obvious differences to our scenario – we use single ESXi host and storage is NFS (accessed through Ethernet not FC). 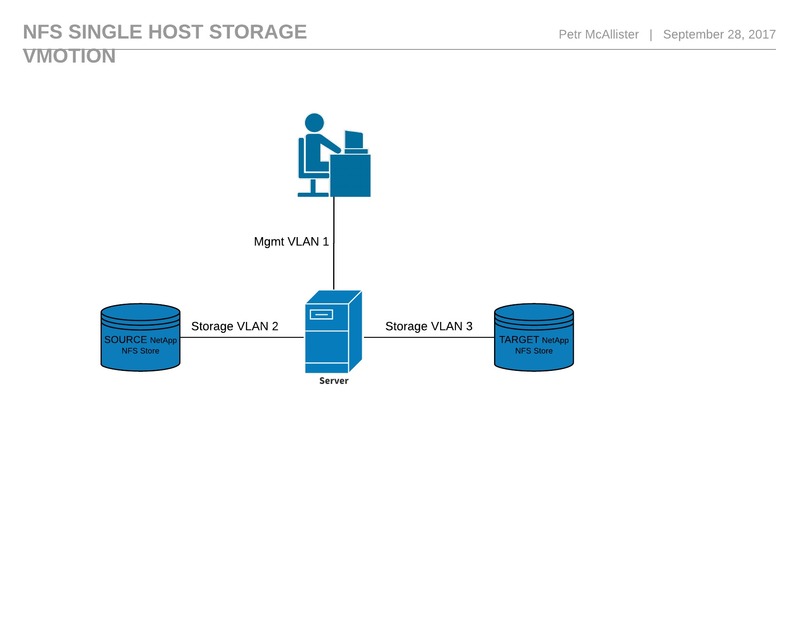 We tested the scenario and can confirm that with the single host Storage vMotion – the data transfer will not traverse the management network. So I wrote it in case someone else faces the same question in their work – here is answer. Probably the diagrams are the best additions to Frank’s post.